Thank you to everyone who attended and contributed towards making MATRIX 2016 a success. Selected presentations are available here, and a gallery of photos taken at the event can be found here. Check out the MATRIX 2016 Conference highlights video! The MATRIX Conference (“Mathematics Awareness, Training, Resource, & Information Exchange”) was hosted over 1-3rd September at University of Leeds, co-organised by the University’s School of Mathematics, the charity MATHSWORLDUK, and New York’s MoMath (the National Museum of Mathematics). The meeting represented a remarkable gathering of more than a hundred top maths communicators from the UK, Europe, and around the world. It featured a line-up of thirty short talks, plus two public lectures. An impressive accompanying exhibition filled a large hall in The Edge. Participants included well-known authors and broadcasters such as Simon Singh, Rob Eastaway, and James Tanton, alongside educationalists, research scientists, computer programmers (such as Google’s Philipp Legner and GeoGebra’s Michael Borcherds), and an array of bloggers, vloggers, podcasters, sculptors, artists, origamists, and designers (notably the University of Leeds’ own Briony Thomas). The programme even featured live music, courtesy of Ben Sparks and his guitar. A variety of organisations were represented, including the Royal Institution, the Royal Statistics Society, the Institute of Mathematics and its Applications, Maths Inspiration, the United Kingdom Mathematics Trust, the Further Mathematics Support Programme, NRICH, and other outreach programmes from Catalonia’s Exhibition in a Suitcase to the Arizona Physics Bus. Our compere throughout was the incomparable stand-up mathematician Matt Parker, who conducted proceedings with his customary cheerful geekiness. 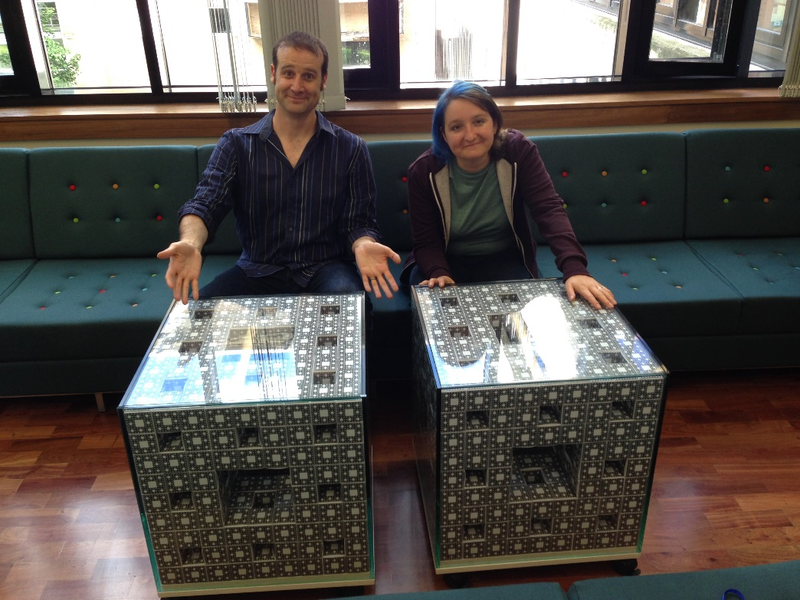 We heard from Katie Steckles, who has run numerous (and eccentric) large-scale maths projects, including building a computational calculator from dominos, and more recently a Mega-Menger Sponge – a giant fractal sculpture distributed across the world, remnants of which can be found in coffee-table form in the School of Mathematics. Her latest is a hand-coloured MegaPixel project, part of the 2016 Manchester Science Festival. Throughout MATRIX, a recurring theme was mathematics in the context of museums. Curators from the USA, Germany, and Spain described differing approaches, and we heard detailed accounts of two exciting new spaces in London’s Science Museum: “Wonderlab: The Statoil Gallery” and “Mathematics: The Winton Gallery”. 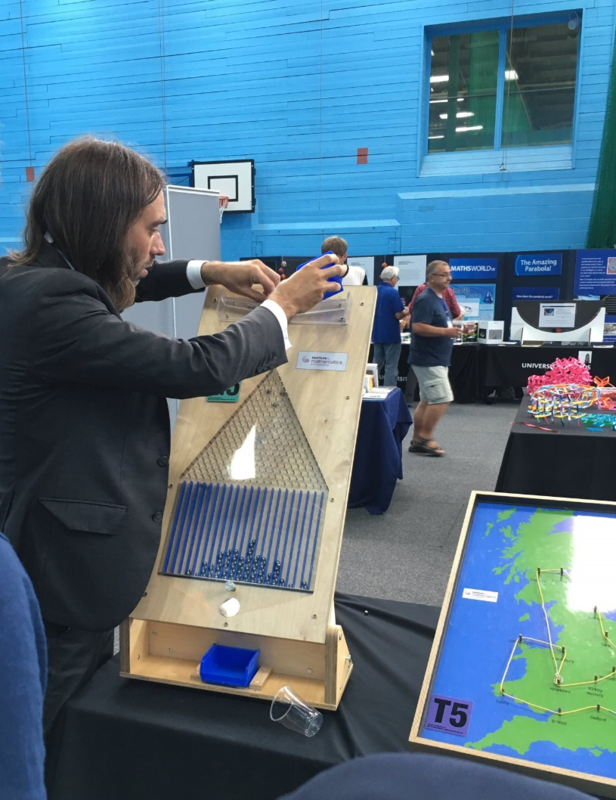 Andreas Matt from IMAGINARY introduced a new generation of electronic infrastructure for exhibitors, while the Chairs of MATHSWORLDUK outlined their vision for a dedicated Mathematics Discovery Centre here in the UK. A number of venues are currently under consideration. Before her talk, Hannah awarded the prizes for the MATRIX Short Film Competition, where UK schools were challenged to create a 5 minute video about a famous mathematician. The winning entry, from Hollygirt School in Nottingham, told the story of Alan Turing. Judging by the quality of the entrants, the future of mathematics outreach is in good hands!